Keep the garage warm this winter with these key heating and insulating measures, and you'll have a comfortable space to work year-round. The typical garage isn’t designed to stay warm inside when outdoor temperatures are frigid. It lacks insulation, and its concrete floor remains chilly all year around. Even with a small space heater running, you probably won’t raise the inside temperature more than a few degrees. When the air inside is bitterly cold, your tools are icy, and temperatures are too low for paint or glue to bond properly, performing automotive repairs or woodworking tasks in your garage can be difficult. So, if you’d like to use your garage workshop throughout all seasons—not just the warm ones—keep reading. 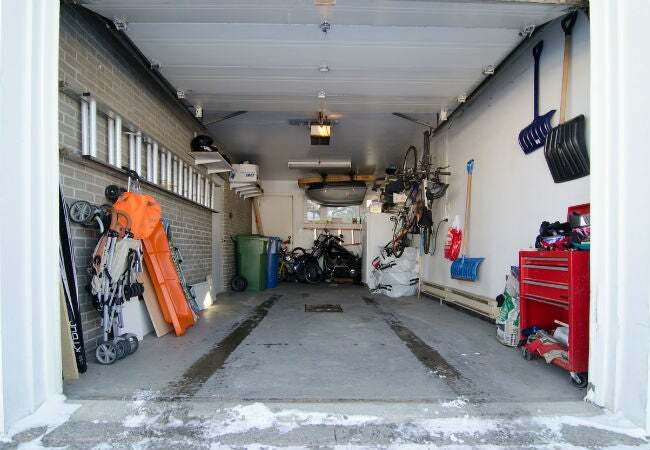 We’ve outlined five tips for heating the garage to a comfortable temperature and creating a productive project space. 1. Choose a heat source or two that are sized for the garage’s square footage. 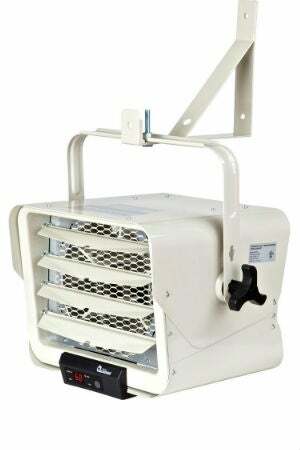 Visit your local home improvement store in late fall, and you’ll find aisles of small and large portable space heaters. Most of these options, however, aren’t powerful enough to heat an entire garage. 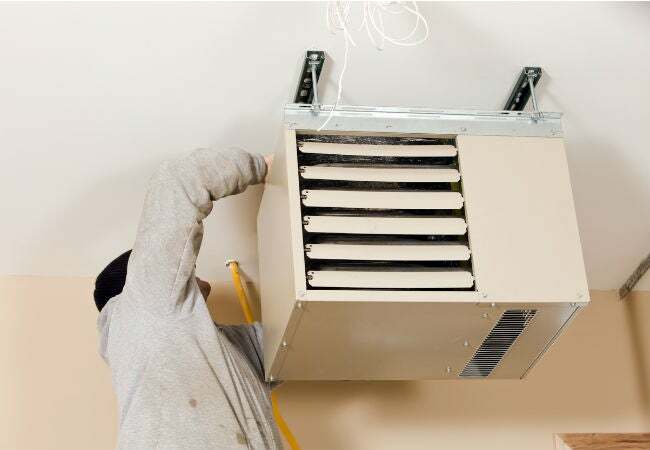 If you’re looking for a serious heat source, consider installing a ceiling-mounted forced-air heating unit such as the Dr. Infrared Ceiling-Mounted Garage Heater (available from Home Depot)—one that is adequately sized for the square foot of your garage. Situating this type of heater in a corner of the garage pointed downward at a 45-degree angle provides the best distribution of warmth. Most of today’s ceiling-mounted heaters come with a remote control and a thermostat, so you can set the temperature you prefer and rely on the heater to do the rest. The only downside to a ceiling-mounted heater is that the inches nearest the floor may remain cold. If your feet are still chilly, try supplementing with a baseboard heater in the area you’re most likely to be working, like the area beneath your workbench. Hydronic baseboard heaters like the Slant/Fin Hydronic Baseboard Heater (available from Home Depot) contain liquid-filled tubes, which are heated to a high temperature. When a fan draws cool air over the tubes to heat it, the returning air then flows out nice and warm at floor level. 2. Finish the walls with fiberglass batt insulation and paneling. No matter how much power your garage heater packs, you’ll find it difficult to maintain comfortable warmth in your garage if the walls aren’t finished. Many garage walls consist of just the wall studs, covered on the outside with sheathing and siding. Without insulation to block, cold air will quickly transfer to the inside of the garage and detract from all of your efforts for heating the garage. 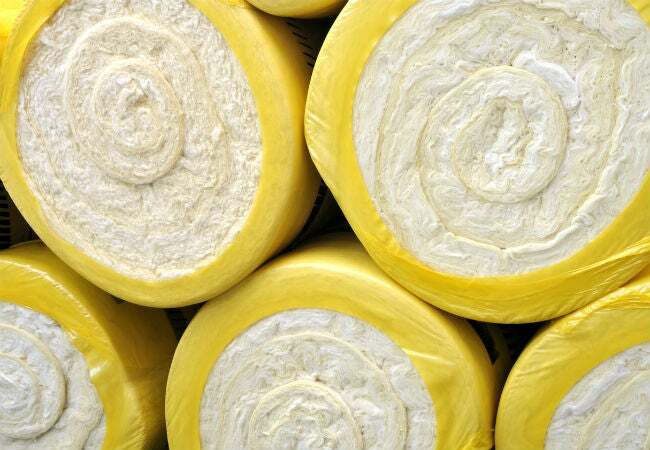 To create an insulted barrier, install fiberglass batt insulation (such as Johns Manville R-13 Fiberglass Batt Insulation, available from Lowe’s) in each stud space and then finish the interior walls by installing drywall panels, plywood sheets, or oriented strand board (OSB). Insulated and finished walls will help retain heat in the garage and you’ll save money on heating bills. 3. Insulate the garage door. Often manufactured from thin metal, garage doors are notoriously cold in winter—in fact, if you live in a northern climate, it’s not unusual to find frost clinging to the inside of a metal garage door. Insulating the door will help keep the cold outside air from transferring through the door and cooling the workshop, keeping the garage an average of 10 to 12 degrees warmer in winter even before you even turn on units for heating the garage. And the process isn’t so intimidating for do-it-yourselfers, thanks to kits that contain all of the necessary supplies, such as the Anco Complete Garage Insulation Kit (available from Amazon). When buying a garage door insulating kit, just be sure to measure your door(s). While the Anco kit will insulate two standard garage doors, garages with oversized doors or more than two garage doors will require an additional kit. 4. Eliminate all other sources of drafts. Garage door frames. Garage doors don’t fit tightly in their frames, so you’ll find small gaps all the way around them. Fortunately, addressing these spots is a quick task when using an integrated weather-strip seal, such as M-D Building Products Vinyl Garage Door Top and Sides Seal (available from Amazon). The self-adhesive strips will help block the gaps so cold drafts can’t enter. Gaskets. If your current garage door is more than a couple of years old, it’s also a good idea to replace the gasket along the bottom of the door. Garage door gaskets are designed to block drafts beneath the door, but, with time, they can become brittle and cracked, which allows cold air to enter. 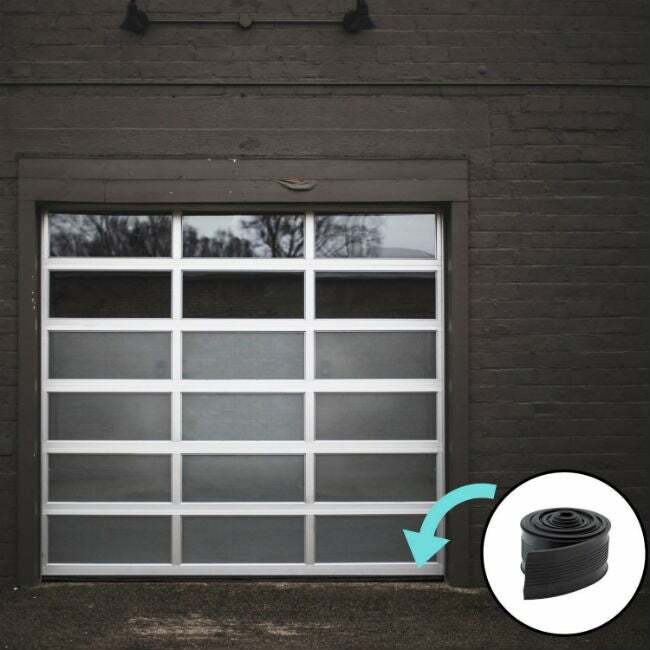 These gaskets are available in various sizes to fit different size doors—measure your door width before you pick up a replacement, such as Houseables’ Garage Door Bottom Weatherstrip Gasket (available from Amazon). Windows. To seal drafty windows, apply shrink-type film to the inside of the windows surface. The film, such as Duck Shrink Film Window Insulator Kit (available from Amazon) is applied with highly adhesive tape to the window frame, and then a hair dryer is used to heat the film, which will shrink it to fit snugly along the window and seal out drafts. 5. Consider radiant heat for your floors. 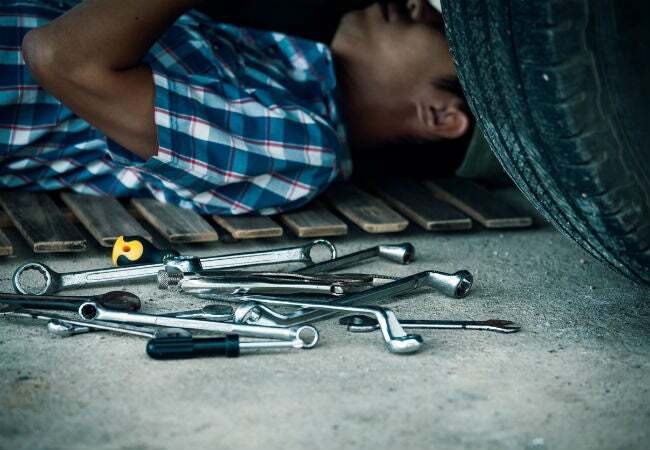 If you enjoy working on automobiles in your garage, you probably dread having to lay on a frigid concrete floor while changing oil or working on an engine. One way to remedy this problem is to install a radiant floor heating system at the time you pour the garage floor. Note: This is only a solution for those who are building a new garage or those planning to tear out an existing garage floor and replace it with a new concrete floor. Before you pour concrete, a reflective liner is installed over fill sand in the bottom of the excavated area, and flexible piping is carefully positioned in loops over the liner. When finished, a boiler is installed inside the garage to circulate hot water through the pipes, which warms the floors and the objects above. If you’re considering renovating the garage, do seriously consider installing a radiant floor heating system during the installation of the new garage floor. Installing a radiant floor system is not a DIY project—you’ll need to hire a plumber who specializes in installing this type of floor heating system. Expect to pay $5 to $9 per square foot to have the system installed, plus the cost of the boiler. But the resulting system is ideal for heating the garage workshop: It effectively warms the space without blowing wood chips and dust around as forced air heater would, keeping your workspace clear of particles that might interfere with detail work.